1. 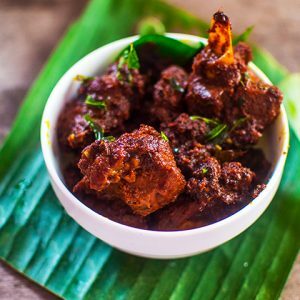 Fry asafoetida and mutton pieces in ghee. 2. Add curd and continue to cook for 10 minutes of medium-high flame. 3. Pour water and add salt to taste. Mix well. 4. Add chilli powder, ginger powder and bay leaf. 5. Fry for a few minutes and add 1/2 litre water. 6. Add 1/2 tbsp garam masala powder and 1 tbsp fennel seed powder. 7. Simmer the mixture till the meat is done. 8. Remove mutton pieces and keep them separate. 9. Boil 2 litres of water and 2 tbsp salt. 10. Tie garam masala and 1 tbsp fennel seeds in a piece of cloth. 11. Put it in the boiling water. 12. Now add rice and cook on a low flame till half done. 13. Drain the rice and cool. 14. Alternately arrange mutton and rice layers in a baking tray. 15. Add milk and ghee. Sprinkle the saffron and the kewra essence. 16. Cook in a preheated oven, covered with a foil, for 20 minutes at 180C or 350F. Feel free to comment or share your thoughts on this Kashmiri Biryani Recipe from Awesome Cuisine.